A person could know South Korea for a long time without knowing Wanju, an obscure county 112 miles south of Seoul. And, at least until recently, a person could know a lot about Wanju without ever hearing of Cha Sa-soon, a 69-year-old woman who lives alone in the mountain-ringed village of Sinchon. Now, however, Ms. Cha is an unlikely national celebrity. 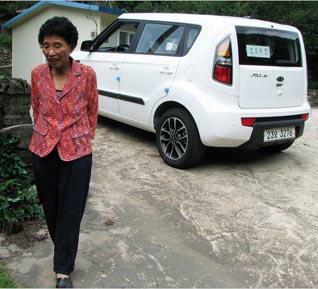 This diminutive woman, now known nationwide as "Grandma Cha Sa-soon," has achieved a record that causes people here to first shake their heads with astonishment and then smile: She failed her driver's test hundreds of times but never gave up. Finally, she got her license - on her 960th try. Hers is a fame based not only on sheer doggedness, a quality held in high esteem by Koreans, but also on the universal human sympathy for a monumental - and in her case, cheerful - loser. "When she finally got her license, we all went out in cheers and hugged her, giving her flowers," said Park Su-yeon, an instructor at Jeonbuk Driving School, which Ms. Cha once attended. "It felt like a huge burden falling off our back. We didn't have the guts to tell her to quit because she kept showing up." Of course, Ms. Park and another driving teacher noted, perhaps Ms. Cha should content herself with simply getting the license and not endangering others on the road by actually driving. But they were not too worried about the risk, they said, because it was the written test, not the driving skill and road tests, that she failed so many times. When word began spreading last year of the woman who was still taking the test after failing it more than 700 times, reporters traced her to Sinchon, where the bus, the only means of public transportation, comes by once every two hours on a street so narrow it has to pull over to let other vehicles pass. They followed her to the test site in the city of Jeonju, an hour away. There, they also videotaped her in the market, where she sells her home-grown vegetables at an open-air stall. Once she finally got her license, in May, Hyundai-Kia Automotive Group, South Korea's leading carmaker, started an online campaign asking people to post messages of congratulations. Thousands poured in. In early August, Hyundai presented Ms. Cha with a $16,800 car. Ms. Cha, whose name, coincidentally enough, is Korean for "vehicle," now also appears on a prime-time television commercial for Hyundai. It is a big change from her non-celebrity life, spent simply in a one-room hut with a slate roof, where the only sounds on a recent summer day were from a rain-swollen brook, occasional military jets flying overhead and cicadas rioting in the nearby persimmon trees. A lone old man dozed, occasionally swatting at flies, in a small shop next to the bus stop. Born to a peasant family with seven children but no land, Ms. Cha spent her childhood working in the fields and studying at an informal night school. It was not until she turned 15 that she joined a formal school as a fourth grader. But her schooling ended there a few years later. "Father had no land, and middle school was just a dream for me," she said. 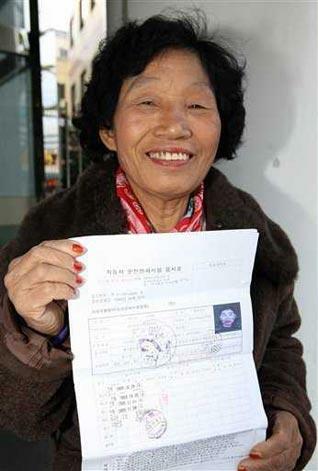 Ms. Cha said she had always envied people who could drive, but it was not until she was in her 60s that she got around to trying for a license. "Here, if you miss the bus, you have to wait another two hours. Talk about frustration!" said Ms. Cha, who had to transfer to a second bus to get to her driving test site and to yet another to reach her market stall. "But I was too busy raising my four children," she continued. "Eventually they all grew up and went away and my husband died several years ago, and I had more time for myself. I wanted to get a driver's license so I could take my grandchildren to the zoo." Ms. Cha tackled the first obstacle, which for years proved insurmountable: the 50-minute written test consisting of 40 multiple-choice questions on road regulations and car maintenance. Early in the morning (she wakes up 4 a.m.) and before going to bed, she put on her reading glasses and pored over her well-worn test-preparation books. She first tried, unsuccessfully, an audio test for illiterate people where questions were read to test-takers. Later, she switched to the normal test. "She could read and write words phonetically but she could not understand most of the terminology, such as ‘regulations' and ‘emergency light,' " said Ms. Park, the teacher. 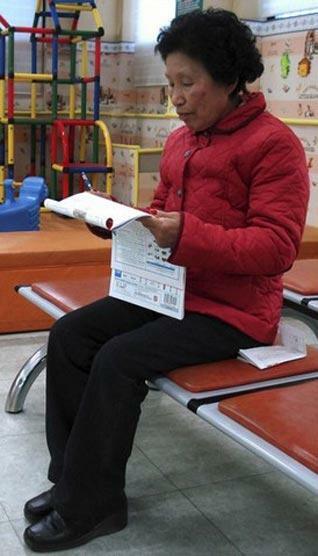 Choi Young-chul, an official at the regional driving license agency, said: "What she was essentially doing while studying alone was memorizing as many questions - with their answers - as possible without always knowing what they were all about. It's not easy to pass the test that way." Practice made perfect, but slowly. She failed the written test 949 times, but her scores steadily crept up. When she came to them early last year, teachers at Jeonbuk Driving School pitched in, giving her extra lessons, painstakingly explaining the terminology. "It drove you crazy to teach her, but we could not get mad at her," said Lee Chang-su, another teacher. "She was always cheerful. She still had the little girl in her." It was only last November, on her 950th try, that she achieved a passing grade of 60 out of 100. She then passed two driving skill and road tests, but only after failing each four times. For each of her 960 tests, she had to pay $5 in application fees. "I didn't mind," said Ms. Cha. "To me, commuting every day to take the test was like going to school. I always missed school." Her son, Park Seong-ju, 36, who lives in Jeonju and makes signboards and placards, said: "Mother has lived a hard life, selling vegetables door to door and working other people's farms. Maybe that made her stubborn. If she puts her mind to something, no one can argue her out of it." About a decade ago, before embarking on her quest for a driver's license, Ms. Cha spent three years studying for a hairdresser's license. For six months, she caught a 6 a.m. bus every weekday, switched to a train and then to another bus to attend a government-financed training program for hairdressers. But no beauty salon would hire her. She was considered too old. No matter, she said. "It was like getting a school diploma." Her tenacity has struck a chord with South Koreans, who are often exhorted to recall the hardship years after the 1950-53 Korean War and celebrate perseverance as a national trait. The country's most popular boxing champion was Hong Su-hwan, who was floored four times before knocking out Hector Carrasquilla to win the World Boxing Association's super bantamweight championship in 1977. His feat gave rise to a popular phrase about resolve: "Sajeonogi," or "Knocked down four times, rising up five." Ms. Cha seems to have given new meaning to this favorite Korean saying. On her wall where she hung black-and-white photographs of her and her late husband as a young couple and a watch that had stopped ticking, she also had posted a handwritten - and misspelled - sign that read, "Never give up!" Comment on "Never Give Up! Try, Try Again ..."